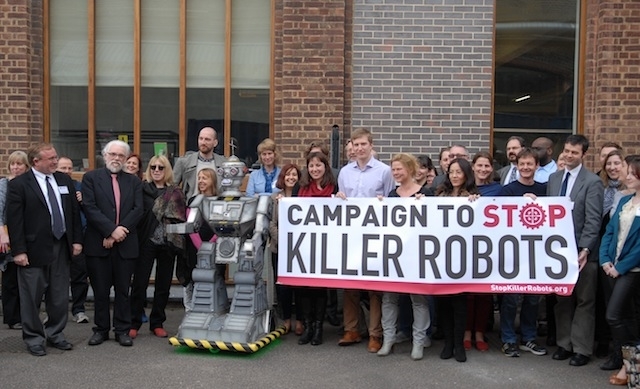 Those involved in the Campaign to Stop Killer Robots are undoubtedly kind and caring Egalitarians, somewhat fashioned after the simplicity of Neville Chamberlain. Unfortunately, their feel-good petition is also indicative of the short-sighted Munich Agreement mindset, which led to disastrous results several decades ago. The notion that we can somehow ensure "peace in our time,” via mere signatures, is the height of naïveté. It assumes that no signee will ever privately recant and that future generations will also subscribe to this approach, even as the number of enslavement-ready technologies grows at an exponential rate. Therefore, its ultimate success is predicated upon achieving a state of indefinite unanimity, meaning that everyone must sign up—without any mental reservations. But, is this realistic? Was there ever a time when there wasn’t at least one joker in the deck, such as a tyrant with a will to conquest? No! In fact, history has taught us that every century has been bloodier than the previous one, despite all the non-aggression pacts and peace treaties. How many more times must we watch this same old bad movie, expecting a different ending? Obviously, we need a more philosophically comprehensive solution. Signatures are unnecessary from those with scruples and ineffective against the unscrupulous, which is why any real solution to this problem requires a top-quality filter to screen out the latter set from acquiring control.